BELIZE CITY, Mon. Sept. 12, 2016–Arriving in Belize on Friday, September 9, was legendary Belizean goalkeeper Nelson “Roo” Robinson, who is the chief architect behind planned festivities at Yabra field this Sunday, September 18, in honor of departed football greats, Louis Garbutt a.k.a. Bembe, the Mugger, of the legendary Dunlop and Independence teams, and Gene Guild a.k.a. “the Japanese Bomber,” of Berger 404 fame. The first “Mugger Day” in Belize was held at the St. Martin’s or Third World field back on September 15, 2013. The Roo visited our sports desk this morning, accompanied by Steve White, Sr. and son Steve, Jr., to inform us of some details of the planned event. The Mugger burst on the scene in the late 1950’s on the youthful Dunlop, when they followed their junior season triumph with a series of spectacular draw games at Edwards Park (now Rogers Stadium) against then reigning senior champions, Diamond-A. Dunlop went up to senior the following season, to dethrone Diamond-A and become Belize City senior football champions 1958-59. After the quick dismantling of this legendary team, due to defections to BEC and the U.S., the Mugger then “brought out” his own team, Independence, along with Serapio “Big Mole” Alvarez and Charles “Qualify” Nicholas; and Independence served to enhance the legend of Di Mugger with dramatic victories against visiting Mexican teams that had beaten “everyone else.” Di Mugger left Belize for the U.S. in 1970, and reportedly continued his football career playing and later coaching teams of Belizean players in New York. Maurice Eugene Guild, known mostly as Gene Guild or “the Japanese Bomber,” as Evan X Hyde dubbed him in 1970s Amandala sports articles, was the young captain of back-to-back Berger 404 football champions of 1974-75 and 1975-76. A powerful striker and midfield general, Gene left Belize in 1980, and, like Di Mugger before him, continued playing football in New York along with other Belizean players who had also migrated to “the Big Apple.” After retiring from playing following an injury in the late eighties, Gene embarked on a very successful musical career as a singer and band manager. On his last visit to the Jewel back in March of 2014, Gene was already making plans to bring his band for Sound Fest the following year; but it was not to be, as we were all shocked by his passing at the young age of 58 in July of that same year. The Roo says that food will be provided for participants in both football games planned for Sunday – a youth game and a veterans game. He will donate footballs to the youths, and provide uniforms for the veterans’ game. At age 75, the Roo says he has been doing some training lately, and plans to spend a few minutes “between the sticks” on Sunday. There will also be some refreshments (until the supply runs out, he insists) for veteran players who attend the event on Sunday. All are invited. 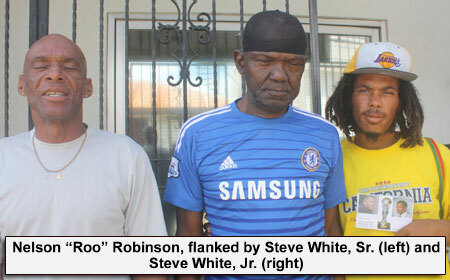 Sunday’s “Di Mugger & Gene Guild Day,” according to Di Roo, is being organized and coordinated by three icons in the Belize football community – Jerome “Peeloff” Maheia, Vincent “Winty J” Johnson and Anthony “Mango” White. The action begins at 10:00 a.m. at the Yabra football field on Sunday, September 18.